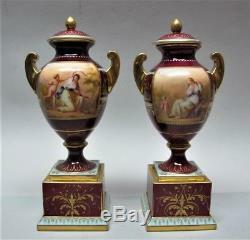 Antique Pair of Diminuitive ROYAL VIENNA Hand-Painted Porcelain Urns c. Antique Pair of Diminuitive ROYAL VIENNA Hand-Painted Porcelain Urns , circa 1890. Our paintings and sculpture range from the 17th C. Inspection of our merchandise is available by appointment in our Roger's Park (Chicago) gallery. FREE PICK-UP IN THE CHICAGOLAND AREA. Up for your consideration is a very fine p.
Air of signed Royal Vienna lidded urns, each hand-painted and jeweled, c. They feature a handled baluster form, one example centered with a reserve painted to depict a maiden holding an arrow and quivers out of Cupid's reach, the other example painted to depict a seated maiden and Cupid, signed. Each against a claret ground with gilt highlights and raised on a stepped square plinth, one example titled. Respectively, each with a beehive mark in underglaze blue to the underside. Overall, the urns are in excellent, presentable condition. One lid has a corner crack and subsequent restoration. It also appears that the finial to the other lid was reattached. These issues are clearly shown in the last two photos, and are difficult to detect under normal viewing. Other than the minor issues with the lids, there are no concerns other than light wear to the gilt, commensurate with age. This quote is for the Continental U. International Buyers § Please Note. The item "Antique Pair of Diminuitive ROYAL VIENNA Hand-Painted Porcelain Urns c. 1890" is in sale since Sunday, March 25, 2018. This item is in the category "Pottery & Glass\Pottery & China\Art Pottery\European Pottery\German". The seller is "thesapphiregallery" and is located in Chicago, Illinois. This item can be shipped worldwide.